I open my bag… What am I going to wear?! The colors don’t change much: white or… white! So white will be! I tie the red scarf on my waist and on my neck I put the small scarf that Aurelien gave me. Well, now I’m properly dressed to the party, let’s go! Bayonne is located in the south west of France. 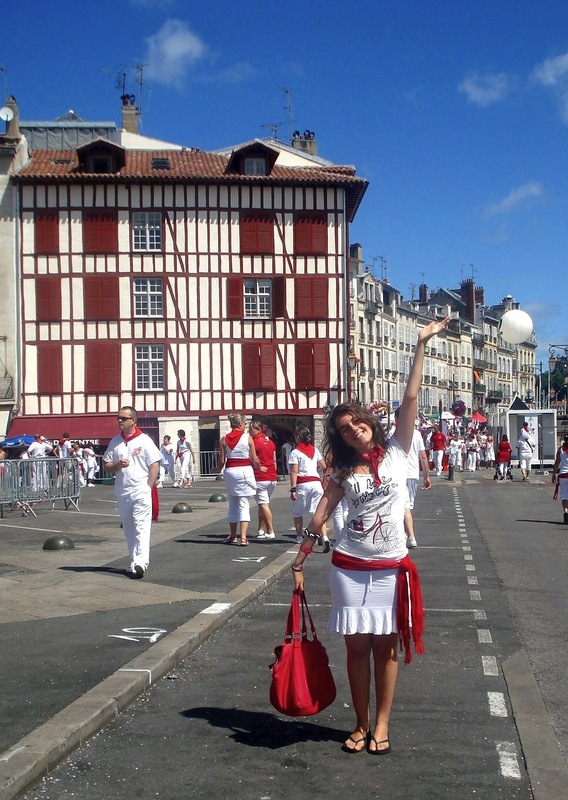 It is such a romantic city that dresses white and seductive red for 4 days in July every year. This colors are mandatory and everybody walks in the streets dressed like this! eets are crowded, some people looking for a table in a restaurant, others bring their own packed lunch and there are those walking with a towel hanging on their shoulders, on their way to pick up the bus to go to Biarritz Beach. We looked more like these last ones. 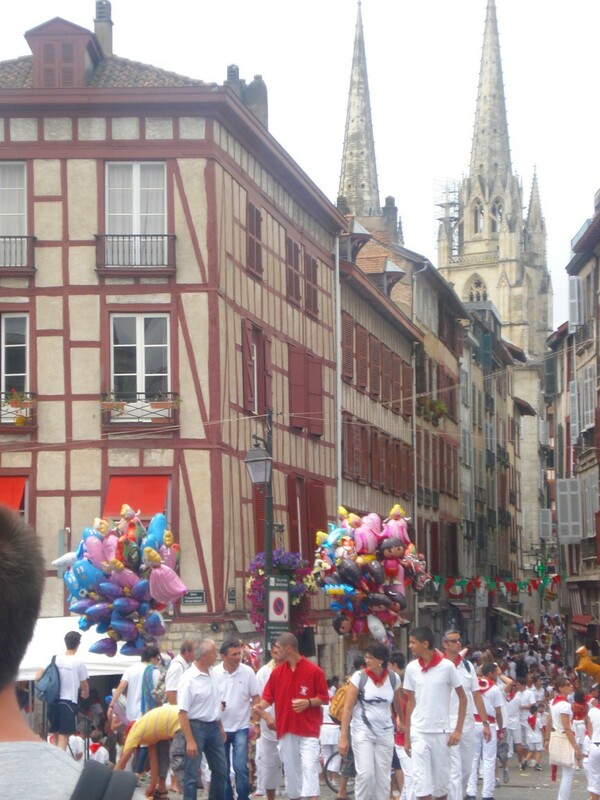 The Fêtes de Bayonne host some bull fights too, but I confess I haven’t seen any! Bullfighting happen in apropriates venues, mostly during the day while we were at the beach. On our way to the bus stop, I observe the athmosphere of this romantic city – window’s shutters are painted in blue, green, yellow… adding a touch of fun to the architecture. I love the narrow streets… the red and white little flags wagging in the gentle breeze. There is background noise that sounds louder and louder as we walk, it tells me that we are getting closer to another street performers filling the streets with sounds… saxophones, trumpets, flutes and drums! No matter what they play really, it’s fun and everybody shakes the dust out of their body, in an harmonious way I call dancing! We walked a bit further through the amusement park, with several little stalls selling cotton-candy, popcorn and ice cream… we are embraced by the rain of confetti that some children throw at us! Just outside a cafe, women dance in a circle. In an impulse I join them, trying to follow the choreography, they welcome me with a smile. So much fun! We get into the bus, getting squeezed… I can even feel the smell of strawberry chewing gum from the girl next to me. The bus starts the journey and we carry on on this party routine!